Every parish is unique. 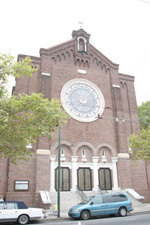 Take St. Edmond Parish in South Philadelphia which celebrates 100 years on June 10. It’s probably the only Catholic Church in America built on the site of a former Chinese cemetery. It is believed to have supplied more young men to the Norbertine religious order than any parish anywhere. Most parishes named for St. Edmund of Abington (or Canterbury) use that spelling. Philadelphia’s St. Edmond’s doesn’t because Edmond Prendergast happened to be Archbishop when it was founded. It was established June 1, 1912, in the Point Breeze section of the city with territory taken from St. Thomas Aquinas, St. Gabriel and St. Monica. Father John Greensill, the founding pastor, celebrated his first Masses at the Point Breeze Theater, and very quickly broke ground for a school on 23rd Street which also served as a Mass site until a church could be built. The size of the parish in the early years is shown by the Confirmation record which showed 625 children and 34 adults confirmed in 1918. With the school came the Sisters, Servants of the Immaculate Heart of Mary, who especially under the guidance of Mother Cyrenia, encouraged many vocations to the religious life. Although Father Greensill was able to ultimately purchase land of sufficient size at the former cemetery for a permanent church and rectory at 21st Street and Snyder Avenue, it was up to his successor, Father James Duffy, who in spite of the Great Depression, to build the beautiful church where Archbishop Charles Chaput celebrated the centennial Mass June 10. For years people called St. Edmond’s “the House that Duffy Built,” in honor of the colorful second pastor. The school peaked at well over 1,000 students and Jean Corsaro Marakowski became a lay teacher (1961-65) and loved it. “My parents were married there,” she said. She and her husband, Michael, settled in the parish and raised their children there, and although no longer living within its boundaries remain members, with Jean an Extraordinary Minister of Holy Communion and Mike an usher. Rita Crawford Baldwin was baptized at St. Edmond in 1932, as were all of her nine children. She remembers the school lovingly, especially Sister Mary Jude. When her house caught fire in 1950, Father William Fogarty and Father Edward McLaughlin visited that same day. “I also remember Father Edward McLaughlin and Father Thomas Bolton. We had great priests, but South Philly is filled with great people,” she said. Today the parish is smaller, with a bit under 700 families but it is still vibrant, according to Norbertine Father Maurice C. Avicolli, the current pastor. The choir, which for decades has been among the best in the city, “is still strong,” he said. “Our religious education program is still vital. Our eucharistic ministers, lectors altar servers and ushers do a super job. Our daily Mass in the rectory chapel draws a faithful group and we have singing every day. The sodality is very faithful. But more important is the outreach, “engaging the youth and the families, and trying to be a positive influence on our neighborhood,” the pastor said, citing the food cupboard that serves anyone in need, regardless of creed. Deacon Stewart’s family moved in when he was 3 years old, and he went through the school taught almost entirely by Immaculate Heart Sisters for whom he has nothing but good things to say. “We had four classes for each grade, I think,” he said. “I was one of the altar servers when Cardinal Krol celebrated the 50th anniversary Mass. Father Barr mentioned church ministry to me in the 80’s and eventually the deacon program. I was ordained in 2000. My grandmother graduated from St.Edmonds in 1922 and was married there in 1929. She named her son Edmond. Years later I taught at St. Norbert’s in Paoli but only recently found out that she was in a parish with Norbertine priests. It must have been a special place for her. I remember our priests at St. Norbert’s fondly. I attended Saint Edmunds from 1952 to 1959 when I graduated. Good school & great education. I was baptized at age 9 along with my other 4 siblings in 1967 here. I remember how I always felt the presence of God there. I started 4th grade on 23rd street in ’68 and remember the wonderful Sisters there. I was part of the choir there from 4th to 6th grade and remember the sound our voices made when we sang in the choir balcony. I remember Mother Emanuella for whom I took her name as my Confirmation name. I was married there also and for a time lived next door to the convent. My first job was at the rectory and got to serve meals to the priests and other bishops visiting. We had my mother’s funeral mass there. She loved this church so much and volunteered when she was well at the school’s library for many years. I have since moved far from Philly and no matter what church I have attended since I have never felt that special feeling I got in St. Edmond’s Church. That closeness and chills as to truly be in the presence of God. OUR PARENTS SENT US TO ST. EDMOND’S SCHOOL. WE WERE SIX, 3 GIRLS AND 3 BOYS. DAD AND MOM MADE IT A REQUIREMENT THAT WE ALL ATTEND CATHOLIC SCHOOL. DAD DIED 14 YRS AGO AND MOM LEFT HER BELOVED PARISH 3 YRS AGO TO MOVE TO N.J.
IRONICALLY, I MARRIED AND MOVED TO STELLA MARIS AND OUR FIRST SON RECEIVED HIS REPORT CARD FROM MSGR. MC LAUGHLIN. HE ASKED DAN IF HE HAD A MOTHER WHO ATTENDED ST. EDMOND’ SCHOOL. MSGR TOLD HIM HE GAVE ALL MY BROTHERS AND SISTERS THEIR REPORT CARDS AND WAS PLEASED TO GIVE HIM HIS. HE HAD A FABULOUS MEMORY FOR NAMES. I WAS MAY QUEEN IN 1952 AND HE, FR. BOLTON AND FR. FOGARTY AND FR, FARRENT, ARE ALL IN MY BOOK, AS WERE THE SACRED HEART BOYS AND FIRST HOLY COMMUNION CHILDREN. BACK THEN, THE MAY PROCESSION WAS A BEAUTIFUL EVENT. I HOPE THEY DO NOT CLOSE THIS BEAUTIFUL CHURCH AS MANY PEOPLE HAVE FOND MEMORIES.GOD BLESS ALL WHO WORK TO KEEP THIS PARISH OPEN! What a great parish! Mom & Dad & sister were married there. We both graduated from the school as did my mom. My grandparents settled there in 1919. I went to St Edmund’s K-4 grade before moving to Delaware County. I would have graduated in 1973. I am looking for my 2nd grade teacher, Miss Sandra. She was my most memorable teacher ever and I believe she totally changed my life. I tell the story to my grandchildren & they teared up. She is one special lady. I had Ms Donnelly in eighth grade back in 1981. I don’t know where she is now but I remember the day that she told my class that she was stepping down from being a teacher and she was becoming a nun and she even put her habit on. we were so surprised. she was one great teacher/nun and hopefully she still is. I have such great memories of St Edmonds. it was sad to see my grade school close but great to see the Parrish is still going on. My father was baptized there 1939 – I was happy to see it still there. I had my First Holy Communion in St. Edmond’s in February 1975. Spend 1st and 2nd grade at the school, then transferred to St. Monica’s. I went to st. edmonds 1970 to 1978. Can you please tell me how I can get a hold of miss Donally? Happy 100 years!!! Hope to here from you soon. Bless You.